BN Advantage will save McLean County! It sounds like $390,000 has been budgeted for BN Advantage for the last two years but never paid. BN Advantage is a consortium of government, Chamber of Commerce, and paid Economic Development people who will promote Bloomington-Normal. All they need is money. Yep, government creates jobs, jobs for bureaucrats. Economic Development is only about CONTROL and salaries for the people running it. These are the same type people who thought the Coliseum and the Bloomington Center for the Performing Arts were the right fit. Downtown would boom with development. Capitalism doesn’t exist when government makes the rules. The last thing someone wants when starting a business is government red tape. ISU dropped the Small Business Development Center several years ago, even though they got State money for it. Did someone ask why? Paying paper pushers to control who can start a business, where that business will locate, and what the business does isn’t compatible with success. All redistribute your money and limit opportunities for others. Just because government builds it, it doesn’t mean anybody will come. If BN Advantage and IWU get your money, expect more Rivian’s, Brandts, Green Tops, and other businesses who aren’t capable of funding themselves. Business only prospers when government isn’t in the way. Posted in BloNo, Bloomington, Local, McLean County, Normal, Progressives, Renner, Taxes.Tagged BN Advantage, economic development, EDC, Green Top Grocery, Illinois Wesleyan University, IWU, Kyle Ham, SBDC, Small Business Development Center, Tari Renner. Tari don’t want any Quick lubes huh, well maybe ole Tari ought to get a lube and SLID right on out of town !! I take my vehicles there and they do a GREAT job, unlike our mouthy mayor. as for Green top. They’ll be gone in less then 3.. I agree, especially on Green Top – what is hilarious, in a dark way, to me, is they touted this place as an oasis in a food desert… uh… no, it’s not. A true oasis in a low to middle income food desert would be a place that carries healthy food without all of the fancy labels and high prices. OH sort of like an Aldi’s….Green Top runs “specials” where the Bacon is only $8.99 a pound and the Carrots only $1.99 a pound. What we need is place like Soulard (St. Louis) only on a smaller scale. Now THAT would be an oasis in a Food desert. Of course if the city ran it it would be an absolute disaster in no time so it would have to be devoid of the stain of city fingers. Of course then the city would be after them constantly trying to find some sort of code violation to smack them with – It’s an endless battle, but one worthy of continuing to fight. 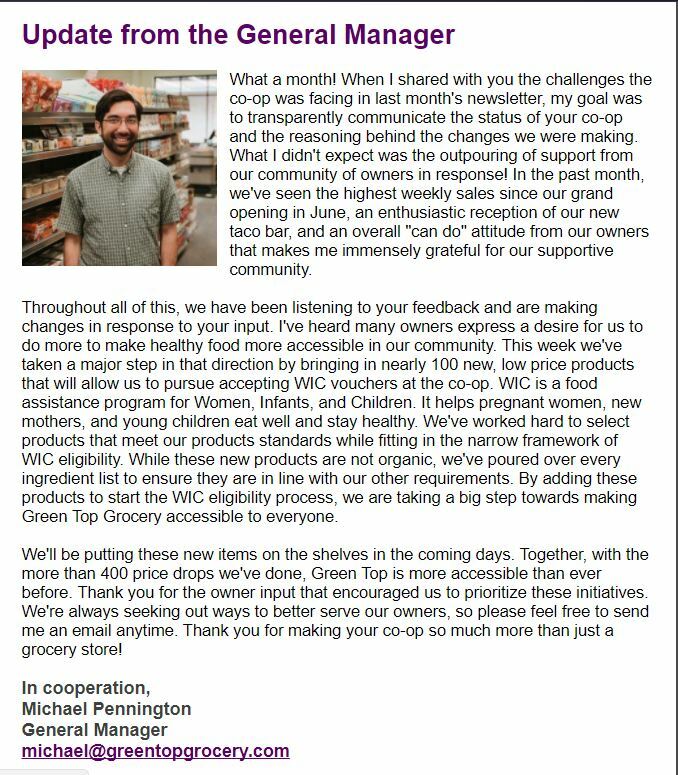 Even though Green Top is within “bicycle distance” we shop, with intent, at Fresh Thyme (former Cub’s location) as they were NOT promoted by His Mayorless and cohorts. As do I, I have made it a point to support Fresh Thyme, I don’t buy a lot there, but I do make it a point to spend some money there at least every couple of weeks, and for the same reasons you do. I made it a point as well to never go to Green Top – even if they were the only store open in town I’d drive somewhere else. Green Top Grocery is a dead man walking. The place is a ghost town, except during member events or workshops. I drive by daily during normal commute times and on weekends. There is little, if any, action to speak of. It appeals to a super small niche market that doesn’t work in a community the size of Bloomington-Normal. In order to sell this, the GTG supports using the poor and attempted to claim the moral high ground by stating that the area is a food desert. As if those that had trouble getting to a grocery store a couple of miles away on Veterans would all of sudden decide to walk or bicycle a few blocks for some free range chicken and organic, local arugula. The elitists who pushed for this project are disgusting! Don’t make the mistake of thinking that that $80K is from “the state.” That’s coming out of your wallet, too! Very true. It comes through the Federal government bureaucrats to the State bureaucrats then local. How many jobs were created for the sole purpose of handing out our money? The EDC does not connect with and reach out to existing high-growth, unique or successful businesses, especially those that bring in money from outside of Bloomington-Normal. Big mistake! Instead, they are chasing the longshot outside company that will, of course, demand “incentives” (read: taxpayer money) in order to relocate here. Or, when they do talk to businesses based in BN, they’re reaching out to those with strictly local customers that don’t bring in outside money and will never scale, like local retailers and members of the Chamber. No offense to these companies, and nothing wrong with a multi-prong strategy. However, the EDC resource allocation is backward! Further, the EDC is convinced that this community is a perfect fit for banking and insurance companies (per their marketing brochures, slides, etc.). Tell me…who is starting a bank or insurance company? In Illinois no-less? And, the existing players, like State Farm, are actually downsizing in the face of disruptive innovation. Hamm should reprioritize and stay away from government and State Farm, and their failed strategies for economic development.